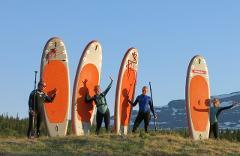 Maya Person, Swedish Champion in SUP, welcomes you and your friends to a unique trip in Åre. It will be fully packed with SUP-paddling, wilderness experiences and hanging out with friends! Everything in beautiful nature and magical waters.